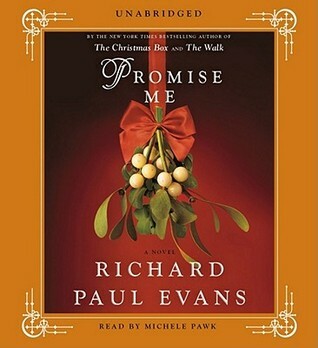 For me, Evans is synonymous with holiday inspirational books. I love to read something from him during the holiday season. I chose this audiobook to listen to for Christmas in July. 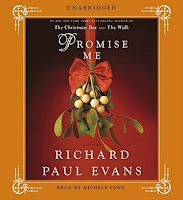 I listened to and loved Evans' The Christmas List (my favourite, 5 stars), A Winter Dream (5 stars), and Finding Noel (4 stars). This one was a bit different from the rest, and it was my least favourite of Evans' books so far because it was just a bit disturbing. More on that later. In addition, the book starts off on such a downer. Beth Cardall finds out that her husband (Mark) has been having a long-term affair with a co-worker. He insists she didn't mean anything. Why do men think that's supposed to make a woman feel better?? A man throws away his family for something that didn't mean anything to him?? Needless to say, the marriage is over for Beth even though the cad doesn't want it to end. Then Mark finds out that he has terminal cancer (a bit of divine justice, I'd say!) and that he doesn't have much time to live. Beth offers to take him back and look after him so that the little time that he has left can be spent with his family. The woman is a saint! Approximately two months after Mark dies, Beth meets a man named Matthew who just won't let Beth say no to a date. He actually insists that he just wants to be friends, and Beth soon finds that she's falling in love with him. This is where the twist comes in and where this book lost favour with me. Beth finds out that Matthew is her daughter's husband from the future. He came back in time as a promise to Beth's daughter on her death-bed, and Beth ended up falling in love with the man who is actually her future son-in-law! This just left me feeling icky and their romance just felt wrong on so many levels. Matthew never should have let himself fall in love with his future mother-in-law. He knew what she was to him. I don't blame Beth because she was in the dark until it was too late. Matthew should have told Beth who he was sooner to curtail the inappropriate feelings they both were developing for each other. Beth never would have allowed herself to fall in love with him if she had known he was married to her daughter. It also bugged me that he used his knowledge from the future to gamble on sports events and make Beth rich, which just seems very ethically wrong to me. And then that ending?! It makes it seem like Beth was just pining away for Matthew for 18 years and that the time with her second husband, Kevin, was like a consolation prize. She clearly still carried a torch for her SON-IN-LAW for all those years, which was just blechy. This book is so not in keeping with Evans' usual inspirational stories. If you have read anything by Evans before, I urge you to try something else that is more representative of his writing like The Christmas List. This didn't feel like his writing at all. It crossed the lines on too many ethical and moral levels. I'm still a fan of Evans, but I just didn't care for this book. 2 stars!! Meh, it was just "okay." There are better books by this author.